In 2014, Baylor University formalized and expanded a strategic, international partnership with Northrise University, the first private Christian university in Zambia. As a part of this partnership, Truett Seminary agreed to work with the Northrise Religion Department to explore the opportunity of enhancing the ability of the Department to equip students for ministry. 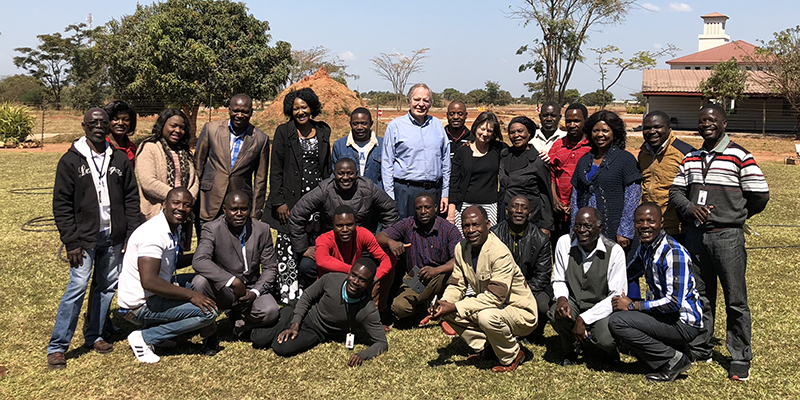 In 2015, Dr. Terry York, Professor of Christian Ministry and Church Music, and Financial Manager Jan Cason participated in an exploratory trip to Zambia to begin this conversation. Following the exploratory trip, Dr. Mike Stroope, Holder of the M.C. Shook Chair of Missions, and Dr. Andy Arterbury, Associate Professor of Christian Scriptures, took a group of Truett students to Zambia to join with Northrise students for a course team-taught by the two professors. This past summer, it was Dr. York and Jan’s turn again. Together, the two team-taught a course for Northrise students who intended to become pastors, as well as a handful of local pastors. For this two-week intensive seminar, Dr. York focused on leadership while Jan instructed the students on the different business aspects of the church. Dr. York and Jan experienced both the challenges and blessings of teaching in and to a different culture. Before making the trip, Jan had engaged in extensive research on laws and finances in Zambia to prepare for the class. One of the personal takeaways noted by Dr. York was a broadening of his approach to reading Scripture. He described the “simplistic approach” of his Zambian students and how it contrasted to his more academic, studied approach. The deliberate and respectful reflection on these differences allowed for a significant learning opportunity for both students and faculty. Dr. York described a special moment that occurred the Thursday evening before he and Jan were to give the Northrise students their final exam. When class had ended, the students set two chairs at the front of the classroom and asked Dr. York and Jan to sit down before leaving the room. Soon, the students returned in a procession, singing an African song that thanked and blessed their two Truett teachers for their ministry. Tyndale House in Cambridge, England is a study center focused on advancing understanding of the Bible. It was there that Dr. Kimlyn Bender, Professor of Christian Theology, found himself this past summer. Although anyone can access the Tyndale library on a daily basis for a fee, to be in residency, you must formally apply. Dr. Bender’s decision to apply for a summer residency was inspired in part by the knowledge that several of his own former seminary and college professors had studied at Tyndale and spoken well of it. During his time in Cambridge, Dr. Bender was beginning his work on a commentary in the Brazos Theological Commentary Series through Baker Publishing Group. The commentary will be on 1 Corinthians. Not only is Tyndale renowned for its excellent library, but it is also recognized for its emphasis on community and fellowship. For example, every day at 11:00am and 4:00pm in the silence of the library, a gong is sounded summoning all of the researchers for a half hour of tea and coffee together. In addition to the daily tea times, Tyndale House also holds a chapel service every Tuesday.